Almost 20 years ago we started a business. It was based on the basic premise that small businesses didn’t have the same experts as big corporations to help them succeed and I knew we could provide that help. In order to eventually help small businesses, we needed to work with the big corporations to help subsidize our desire to reach the markets that needed us most. We have now spent more than a decade meeting amazing people and helping businesses improve their service and guest experience. We have become the experts at creating a fun and amazing training experience. Over the years, I spent significant time studying "guest satisfaction" – how to measure it and what it means. I was shocked when I found that research out of Harvard University said there is zero correlation between customer satisfaction and future growth. I was beyond shocked. All I could see was the business I had built would be out of business because the training we did to help create satisfied guests was a waste! Then, I had an epiphany: The research the R-Factor is based on was the answer I was looking for. It was a better way to measure and predict future results. This study is what we needed to take our business to the next level. We could help our big corporations measure and improve their service. We could make a real impact on their business and on their guests’ experience. This was almost eight years ago. Now, we’re getting back to where we started. How can we help small to average size businesses get the same tools and expertise the big guys have so they can grow and excel. It’s simple: Bring the R Factor data, information and recommendations to them. This is an amazing tool that can be the difference between success and failure! For our corporate clients, they will invest hundreds of thousands of dollars a year for the studies and improvement. We knew that wouldn’t work for most small businesses so we have made it a simpler and more specific so they can get the information and action items they need to keep existing customers and get more referrals. This is an amazing tool that, once you use it, you will see, is priceless. For some of you it may be like when we purchased our first computer, we didn’t have the couple of thousand dollars lying around to do it but it changed our business forever. 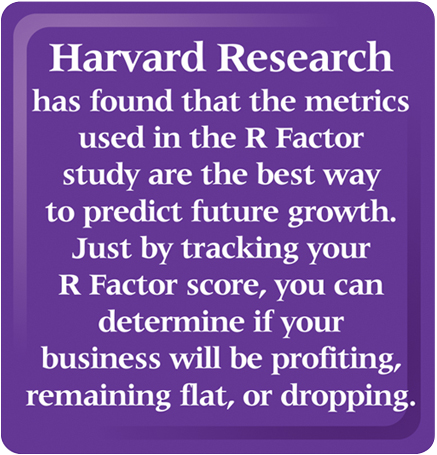 Your R Factor study will do the same for you. This is a real investment in your business and your future. Cost = Expense. Investment pays you back plus interest!